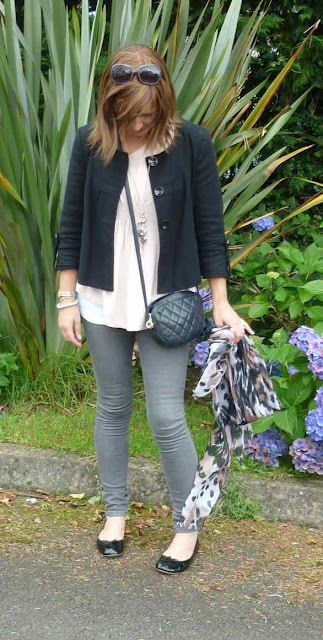 Another outfit post from Tipperary. I'm back in Belfast now after spending a lovely 4 days with the family and both daughters survived several more walks along the riverside (without blog photos...lesson learned!). Wearing a mixture of pieces you'll have seen before, apart from the jeans, which I picked up in Primark last week for £5. They're a lovely shade of grey and by far the best jeans I've ever bought there. The denim is stretchy without being baggy at the end of the day, the fit is excellent and the rise is suitable for keeping mum tums in check! I dithered over the leopard print Primark jeans while I was in last week. Joanna at Poppy's Style wore them so well on her blog here and I like that they are not leopard print really, more of a brushstroke pattern. What do you think? Should I road test them for you? Today's photos were taken by my handsome godson, Evan, in his first assignment as blog photographer. Evan and his brother, Lewis, live in Tipperary so unfortunately, I don't see them as often as I would like to but we had good times with them this visit. 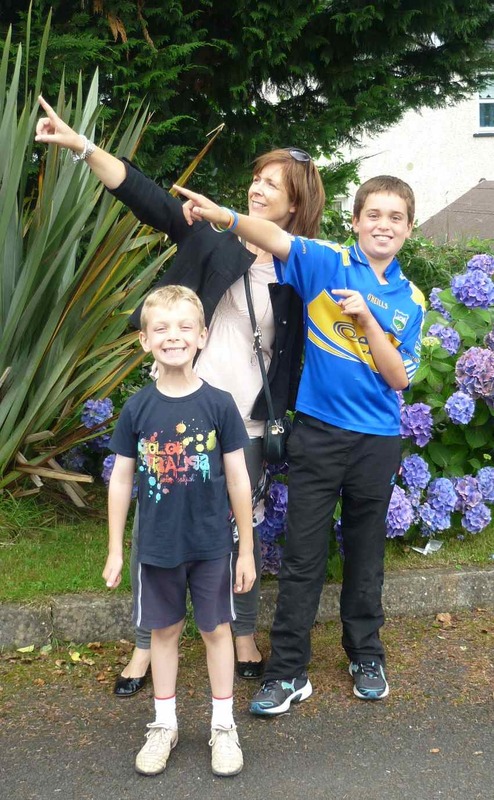 Here's Evan and I doing our Usain Bolt impressions while Lewis gives us a mega smile! I think by the next time you come down Evan will have passed you out in height. Lovely photos. Good job Evan. Lovely jeans too. I absolutely love the primark leopard jeans. Am going to get loads of wear out of them in the A/w. simply adore that bag as well. Stunning!! Great outfit. Love the colours ... and v jealous of your bag! Looking great, I really wish I had that scarf! I might get some Primark jeans, fed up with hearing good things about them and not trying them myself! What a bargain - I love the scarf. I like the grey jeans - I have a pair of grey jeggings from New Look which I adore because they are the perfect grey and soooo comfy. I've seen the leopard Primark jeans and they scare me a little because the print is quite strong but I have to say your friend Poppy wears them well (something to do with great legs). I have grey snakeskin ones though which are quite "subdued" and I hope to get a lot of wear out of them come Autumn.